Note: 6 water tight bulkheads, fitted with Bow rudder. Detroit & Cleveland Steam Navigation Co. Designed by Frank E.Kirby. 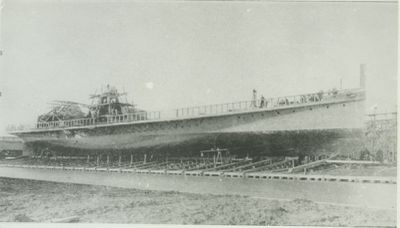 Launched March 17, 1893. 44", 66" x 11' engine, 2000hp, 27rpm, F.A. Fletcher & Co., Hoboken, NJ, 1893. Wheels are Morgan feathering type. 12'x 20', 120 #steam, scotch boilers, Detroit Dry Dock Engine Works, Detroit, MI, 1893. 1897, Jul 21 Ran on reef in Thunder Bay, 1/2 mile from shore; freed by tugs. 1912 Named changed to CITY OF ALPENA II. 1921 Owned Graham & Morton Transprotation Co., Chicago, IL; renamed CITY OF SAUGATUCK. 1924 Owned Goodrich Transit Co.
1933 - 35 Idle at dock in Benton Harbor. 1934 Owned Michigan Trust Co., Duluth, MN. 1935 Owned Captain John Roen, Sturgeon Bay, WI. 1938 Owned Roen Steam Ship Co.; rebuilt as pulpwood barge, 241.7' x 38.5' x 13.23', 999 gross tons; renamed LEONA. 1945 Owned Northern Paper Mills, Green Bay, WI. 1946 Owned Northern Paper Mills of Canada, Hansen, ONT; renamed NORMIL, C176163, towed by NORCO. 1955 Owned Marathon Paper Co., Marathon, ONT. 1956 - 57 Idle at Sturgeon Bay dock, sold to Green Metal Co.